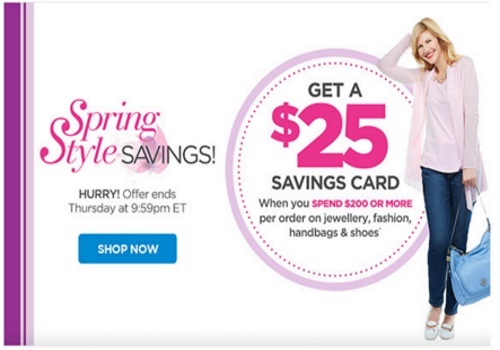 The Shopping Channel has a Spring Style Savings offer on now! Get a Free $25 Savings card when you sped $200 or more per order on jewellery, fashion, handbags and more. Qualifying purchases must be made during the period of March 22, 2016 at 10pm ET to March 24, 2016 at 9:59pm ET. Only one Savings Card will be issued per customer. Savings Cards will be sent to qualifying shoppers by email to the email address on their account, or mailed to the mailing address on their account where no email address exists starting April 25, 2016. Savings cards expire on June 30, 2016 11:59pm ET.